There are so many sites, blogs, Facebook pages, and people on Craigslist, and other classifieds sites selling lenses, it's hard to imagine where all these lenses are coming from, and if they're the real deal or not. 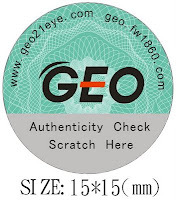 Some brands like Besvue, Dueba, G&G, and others don't offer any sort of counterfeit detection system, but Geo Medical, the leader in circle lenses does. Fake lenses can seriously damage your eyes. If you can stomach seeing a really gross infected eyeball, visit the Geo Police. 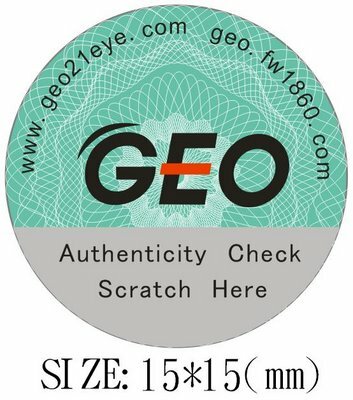 This is a blog dedicated to calling out sellers of counterfeit lenses, and showing consumers what the authentic Geo Medical counterfeit detection sticker should look like. Why is it so important to use only authentic lenses? Consider this, have you ever bought a knock off handbag, maybe a Cuess, or Vuis Luitton? These bags look similar to the real thing but are made of cheaper materials, using cheaper manufacturing methods. These bags often end up with malfunctioning zippers, handles that break off, and liners that are easily torn. The same can be said about counterfeit lenses, but with much more devastating consequences than having to carry your purse home with no strap. Fake lenses are often made using clear, daily disposable or three month disposable lenses, which are cheaper than yearly disposables. Using daily disposable contact lenses for a year could have serious effects on your eyes, especially dehydrating the eyes. The method that the colour is applied to the lens is different as well. Authentic Geo Medical circle lenses are coloured using the Dyeing Process, which allows the most oxygen to reach the eye, resulting in a more comfortable experience for the wearer. This is the safest type of lens, and the kind you can only get for sure from Geo Medical. Don't trust your eyes to just any cheap circle lenses. Be sure to only use quality, authentic, circle lenses from a source you trust!